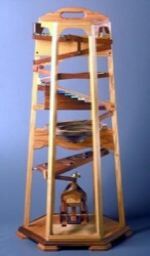 Home / Kids Toys & Furniture / Childrens Toys and Games Woodworking Plans for Projects / Marble Tower Woodworking Plan. 04-FS-102 - Marble Tower Woodworking Plan. A popular wood project packed with action. This is one of the leaders in woodworking plans sales in the country. A conversation piece in wood. Marbles release every 2 seconds to cascade down and around a network of troughs, ramps and over a xylophone. They ring bells, spin paddles and trip levers. Children are captivated by the action of the fun, Rube Goldberg-like mechanism. Full size patterns.